After mourning the recent deaths of some close BASE jumping friends I needed a break from Moab to explore new sceneries and reset the brain. My immersion into the sport of BASE jumping has been one of the most incredible adventures of my life, however, it also comes with extreme moments of sadness and joy oscillations. In order to clear my mind from the desert dust, I decided to spend all of December living in a noisy airplane hanger at Lodi, California. 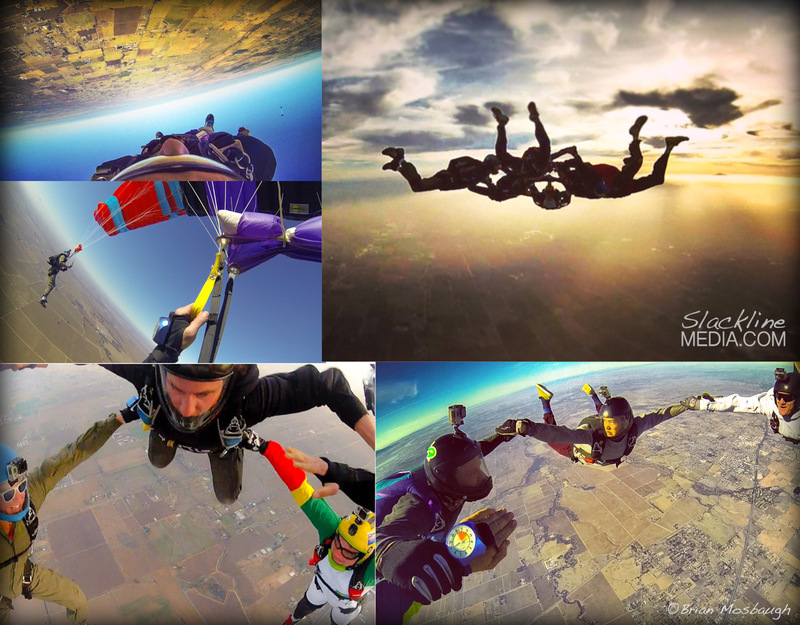 It was a unforgettable adventure spent skydiving everyday, learning new aerial skills and improving my canopy control with inspiringly talented people. The world of air sports never ceases to amaze me with the diverse and awesome crowd it attracts. This sky tribe devotes more time learning to relax in the air than standing on the ground, which breeds incredibly coordinated aerial acrobats who literally play amongst the clouds. Everyone smiles a lot and learns to tolerate the noise and smell of airplane engines daily. After all, flying out of aircrafts some 13,000′ above the Earth’s surface definitely requires sacrifices of sorts. If you haven’t had the pleasure of falling with your friends in pure air I highly recommend you do so. It’s proven to cure your mind of all the petty mental obstacles we manifest and is guaranteed to put you in the flow of each moment. 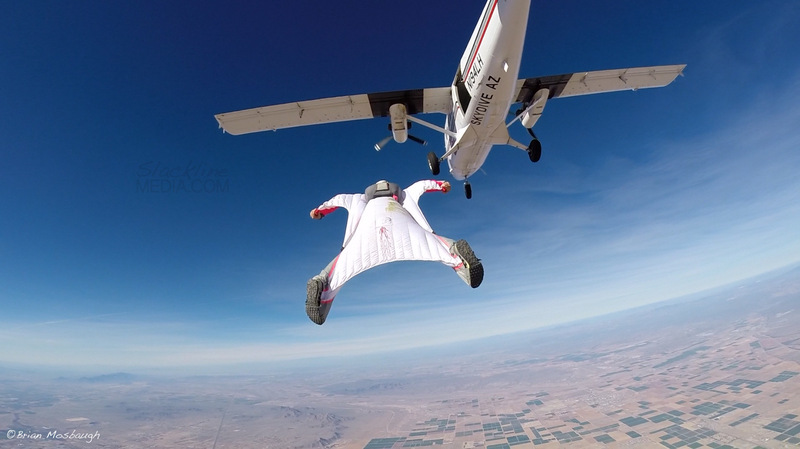 In general, skydiving may not be the solution to your financial debt problems, but I once heard it cured cancer for someone… It’s science, don’t question it! After completing 75 new skydives I decided it was time to speed off from the drop zone back towards Moab, Utah. As soon as I got back to the desert I shared a loving embrace with my girlfriend and promptly rode off into the sunset on an adventure down south toward Puerto Rico. We spent close to a month practicing traditional yoga, acroyoga, slacklining, climbing, surfing and dancing with many wonderful people at the Redefining Balance retreat, that my dear friend Adi Carter hosts every year. If you’re ever wondering how to spend your January or February months, and you have a week or more of freedom to indulge yourself (preferably as much time as possible) I recommend booking a cheap ticket down to this wonderful island paradise where you’re guaranteed to experience an overwhelming amount of natural beauty and radical community all around. This little island hosts a huge abundance of natural waterfalls, jungles, beaches and relaxing island culture in every directions of its small land occupancy. Adi is an amazing teacher, masseuse and yoga master who will guide you toward better balance, beauty and relaxation to spice up your life. 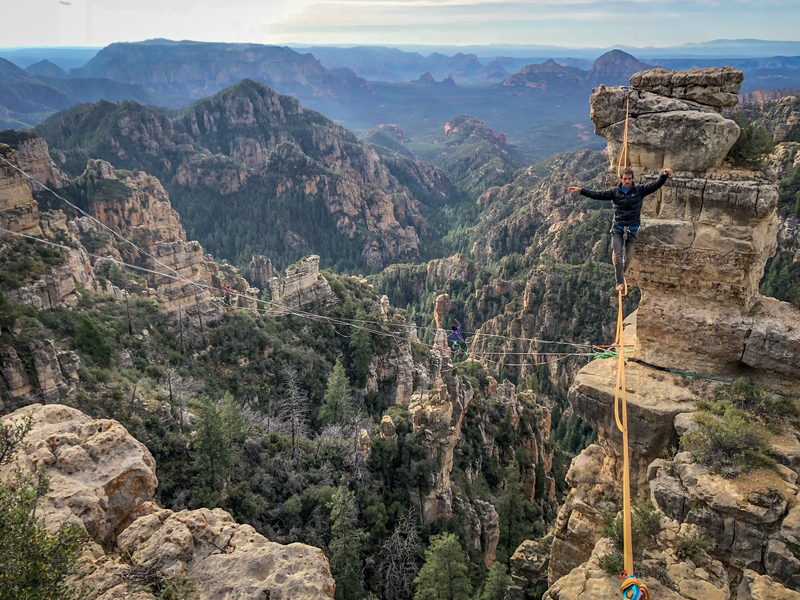 So to put things simply, I spent many weeks improving my balancing skills, playing in the tropical blue waters of the ocean and sharing continuous smiles with amazing people… After many layovers and several connecting flights, I once again returned to my desert playground of sand and stone in Moab, Utah. With only two days of getting settled in my own bed I began packing yet again for another trip, one that swept me off toward Arizona where I started a new chapter of adventure film making, producing an upcoming web series called Exit Point. This project is all about documenting the lives of some of my many talented female BASE jumping friends as they travel the globe and explore the limits of human flight together. Collectively they’re an awesome bunch of people who come from different backgrounds and share a committed passion of flying. This is only the beginning of a huge unfolding adventure which is taking on more momentous creativity with the Exit Point team. Aside from a million details left out here and there, that’s the run of things as they happened since November of last year. As mentioned, keep checking back as I continue sharing links to the upcoming videos and adventures of the Exit Point team of female bad asses.